President George W Bush has signed into law a measure that will expand the rights of the unborn child. In an elaborate ceremony at the White House, Mr Bush approved the Unborn Victims of Violence Act. The new legislation makes it a crime to harm a foetus during an attack on a pregnant woman. Opponents say the move is an attempt to erode women's rights to abortion, but supporters say its aim is merely to protect the unborn child. 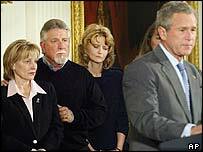 President Bush, flanked by the families of women who had been killed while pregnant, spoke eloquently in a televised ceremony about why he was supporting this bill. He said it was an attempt to address the fact that a crime against a pregnant woman often has two victims - and therefore two offences to be punished. Then, with a flourish, he sat down at a nearby desk to sign the measure into law. It has been named Laci and Connor's law, after a woman and her unborn son who were killed last year. 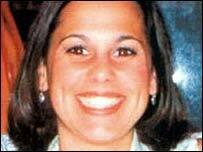 The case has received huge media attention, with the husband facing murder charges. President Bush's Democratic challenger, John Kerry, opposes the law. It could become a polarising issue in this year's presidential campaign, along with other matters of public concern like gay marriage and indecency in the media. Opponents say this law undermines a woman's right to abortion because it recognises a foetus as a human being from the moment it is conceived, and could possibly be used one day to take away abortion rights. But supporters say this is not about the issue of abortion, just protecting unborn children from violent attacks.